Like most peak systems in Acadia, Dorr Mountain is a narrow north-south formation with steep cliffs on its east and west faces. Sandwhiched in between Champlain Mountain to the east and Cadillac Mountain (the highest peak on Mount Desert Island) to the west, Dorr Mountain offers outstanding summit views in all directions, despite it not being the most well-known peak in Acadia. Dorr Mountain has four separate trails that lead up to the summit, but the most interesting route is known as the Ladder Trail--a challenging trail that works its way up the steep east face with the help of a few ladders and iron rungs. Despite its ominous name, this trail is a bit less exposed and intimidating than the Beehive or Precipice Trail. WARNING: This hike is not suitable for small children or anybody who has a fear of heights or who isn't steady on their feet. For a less intimidating hike up Dorr Mountain, please see the Dorr East Face Trails. Rating: Fairly strenuous day hike with a few iron rungs and ladders. Access: Gravel roadside parking just south of the Tarn (lake) on Route 3 (south of the Sieur de Monts Park Entrance). Elevation Change: 1100-ft steep ascent to top of Dorr Mountain. The trailhead is located roughly half a mile south of the Sieur de Monts Park Entrance along Route 3. After you drive past the Tarn (a large lake located on the west side of the road), look for and park at a gravel pullover with a trailhead marker at the edge of the woods. (There is no formalized parking lot here.) The intimidating east face of Door Mountain can be seen peering from behind the trees. 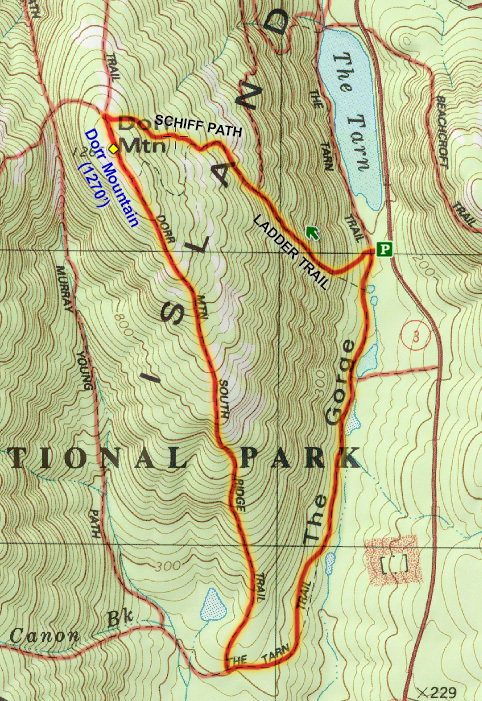 Begin hiking west, passing over the intersection with Kane Path. The Ladder Trail doesn't waste any time getting vertical. Hike up the long row up steps that hugs one of the cliff bands. 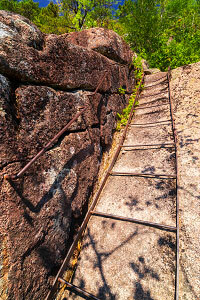 After about 15 minutes of hiking, the trail passes between a very narrow break in the granite, then turns sharply left at the base of the first iron ladder. Climbing the old ladder isn't too difficult, but since it is resting loose on the rock, use the handrails on the side instead of grabbing the rungs of the ladder. Above the ladder, the mountain starts giving way to some terrific views of the valley below. Next comes a short set of iron rungs to climb up, followed by a wonderful little granite alcove to walk through that leads to a second short ladder. After the second ladder, the iron route is over, but the trail continues its steep ascent along another cliff band with well-placed steps leading the way. Soon enough, the Ladder Trail joins up with Schiff Path (previously known as Dorr Mountain East Face Trail) and continues up the mountain with a more moderate rate of elevation gain. Once at the trail intersection at the top of Dorr Mountain, hike south just a bit to tag the summit marker. The views are wonderful in every direction, especially the taller Cadillac Mountain to the west. 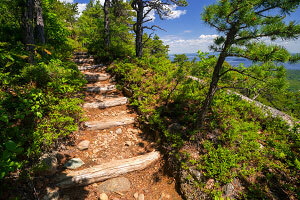 To complete the loop hike, a good option is to continue hiking down the Dorr Mountain South Ridge Trail. This route descends at a much more moderate rate, but the scenery is still wonderful as you descend through the many layers of the mountain. Once the trail reaches the base of the mountain and joins up with the Canon Brook Trail (formerly known as The Tarn Trail), we are now back in the thick forest. Follow the Canon Brook Trail east, then north as it turns and passes a lovely pond formed by an enormous beaver dam. Continue north to rejoin with the trailhead. While Ladder Trail might not be as thrilling as the Beehive or Precipice Trail, it is still a terrific hike up a cleverly engineered trail. For a longer hike, consider continuing over to Cadillac Mountain or taking one of the numerous other connecting trails surrounding Dorr Mountain.